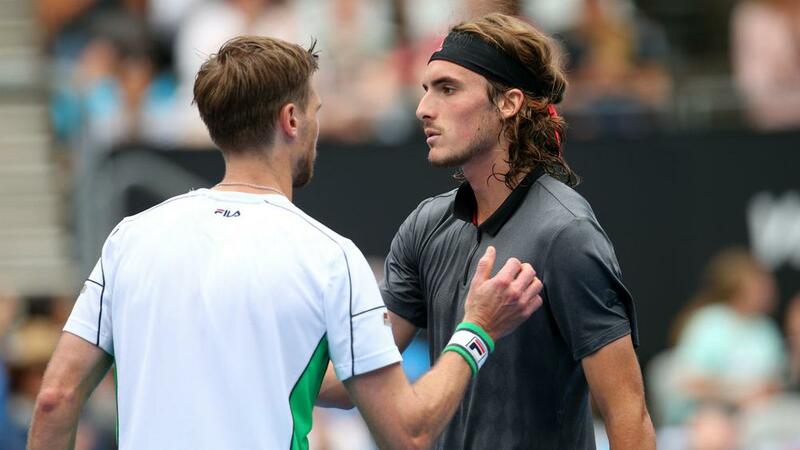 Top seed Stefanos Tsitsipas lost at the Sydney International on Thursday, as Jan-Lennard Struff battled through in Auckland. Andreas Seppi dumped top seed Stefanos Tsitsipas out of the Sydney International, while German duo Philipp Kohlschreiber and Jan-Lennard Struff knocked out the final two seeds in the ASB Classic on Thursday. Seppi struck a blow for experience over youth, coming from a set down to beat the promising Greek 4-6 6-4 6-4. Veteran Italian Seppi claimed the only break of the second set and that decisive break in the third to lead 5-4, then showed no signs of nerves as he served out the match. Gilles Simon was pushed all the way as he ensured no other seeds would lose in Sydney, eventually prevailing 7-5 3-6 7-6 (7-3) against Australian John Millman. There is one home favourite in the semi-final draw, though, as Alex De Minaur knocked out compatriot Jordan Thompson in straight sets. Diego Schwartzman will play Seppi on Friday after a 6-1 3-6 7-6 (7-1) win over Yoshihito Nishioka. Meanwhile, Fabio Fognini and Pablo Carreno-Busta both fell by the way side in Auckland, with Kohlschreiber and Struff reaching a semi-final draw that contains no seeded players. Kohlschreiber will play Tennys Sandgren after easing past second seed Fognini 6-3 6-1, but life was tougher for Struff, who endured a long day that included beating Carreno-Busta. Struff was forced to go to three tiebreaks in a 7-6 (7-5) 6-7 (6-8) 7-6 (9-7) singles win in the last eight, while another two were required as he teamed up with Ben McLachlan in the doubles semis and defeated Wesley Koolhof and Marcus Daniell. The German played just short of four and a half hours in all and will be in action again on Friday, with Briton Cameron Norrie his next opponent after Taylor Fritz, who had knocked out John Isner, was seen off in straight sets.